This updated full-color guide to colored gems provides concise yet comprehensive information on quality evaluation, price comparison, gem identification, cutting styles, treatments, fake stones, optical effects, gem care and geographic sources. Many of the gems are shown mounted in striking designer jewelry. There are 323 new color photos and several new gem species and varieties in this new Third Edition. Also included are interesting historical facts mixed with scientific data and a bit of folklore. 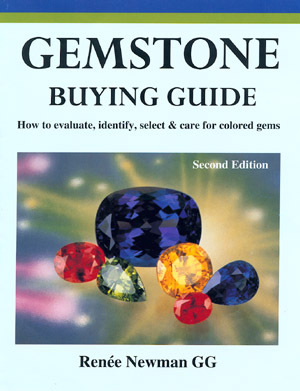 Written for consumers and professionals, the Gemstone Buying Guide is a practical, well-illustrated resource for buying, identifying and caring for colored gems. If you want to become a savvy buyer and learn how to select colored gemstones, then you’ll find the Gemstone Buying Guide a fascinating and valuable resource. For information on a companion guide, Rare Gemstones, click here. "If you are at all involved in buying and using gemstones you probably already own the previous edition of this wonderfully useful book. But much has transpired in the gem world in the 13 years since that edition. New gemstones have become popular and new treatments and imitations have appeared. Renée Newman’s completely revised third edition will bring you up to speed. The first six chapters focus on all the factors affecting quality: color, shape and cutting style, clarity and transparency, treatment status, carat weight, and more. Each of these is discussed in detail, well illustrated with helpful examples and references to actual dollar values. As this is principally a colored gemstones book, color receives an especially thorough treatment. Hue, saturation, uniformity, and other factors are explained and well illustrated, along with discussions of how lighting affects color and even psychological factors. A brief section discusses phenomenal stones such as stars and cats-eyes. Then follows the largest section of the book, “Gemstone Descriptions” (78 pages). Here, each variety is discussed and illustrated along with technical data, history, sourcing, pricing, and important factors to look out for when buying. Of course this includes all the usual gemstones you would expect, but with updated information. And there are some (e.g., danburite, kyanite) added since the previous edition as well as some (e.g., ammolite) that have since come into wider usage. (Some of these “exotic” gems are more fully treated in Newman’s series of “Exotic Gems” books.) The book ends with a chapter on caring for your gems; useful charts of hardness, refractive index, and density; and a bibliography and index. One point to be aware of is that this edition is one inch narrower than the previous one, so illustrations are a tiny bit smaller. The upside is that the newer edition is more convenient to carry on those gem shopping sprees. This book advertises itself as “straight talk on buying gems” and that’s precisely what it delivers. Like all of Ms. Newman’s gem books the writing is clear, concise, and helpful. The previous edition was reprinted nine times, just to give you some idea of how well regarded her gemstone writings are. So if you are still holding on to your dog-eared previous edition, it’s time to update. And if you’ve never owned any version at all you are in for a real treat." Chapter 1 explains coloured gemstone pricing factors. Chapters 2–6 explain how to examine a stone according to the ‘4 Cs’ (cut, carat, colour and clarity). Chapter 7 is a short section on cat’s-eye and star stones. Chapters 8–9 cover various treatment processes and the identification features useful for dis-tinguishing between natural and synthetic gem-stones. Chapter 10 warns the reader about practices done with the intent to deceive the gemstone buyer. Chapter 11 provides 77 pages describing the history, characteristics and sources of the more important gem varieties on the market, organized alphabetically. Chapter 12 concludes with a short but nonetheless important section on how to care for your gems. The final pages contain a tabulation of birthstones and anniversary stones, followed by a list of gem varieties in order of descending Mohs hardness. The book includes several new gem varieties that were not covered in previous editions. It is also a ‘feast for the eye’, with 356 colour images by a variety of photographers. Newman once again included several of my photos, which I greatly appreciate. She has also conveyed captivating historical information on the gems that she profiles. The book is an excellent tool for the novice, as well as for knowledgeable members of the gem and jewel-lery trade. I recommend Newman’s book to anybody buying or selling gemstones. "Far more than a buying guide, it is one of the finest collections of gem photographs I’ve ever seen. The book is a delight for family and guests when laid on your coffee table...The amount of work in this book is to be believed only by holding it in your hands. If you see the book, you will probably purchase it on the spot." "An excellent book for the photographs alone, but such a concise way to inform the reader of the many aspects of gemmology and jewellery buying is superb. In an easy-to-read format, Renée Newman has been able to capture the fundamentals of buying coloured gemstones, including jade, opal, topaz, garnet, ruby spinel, chalcedony and tourmaline. The book is illustrated with excellent color photographs, gemstone description charts, and information on evaluating colour and transparency. The author advises in detail on the majority of gems available to the consumer, including research material on treatments, synthetic stones and styles of cuts. The book discusses prices for each of the gems outlined, as well as quality, evaluation, cleaning and care. I found this book a pleasure to read and to look at, and have referred back to it many times to verify my own experiences. I recommend this book to all lay people who want to buy gemstones and to gemmologists who need to be reminded of the importance of the buying process–something which we sometimes take for granted." "Comprehensive, factual and well-presented...Particularly noteworthy in this book are the quality colour photographs that have been carefully chosen to illustrate the text. 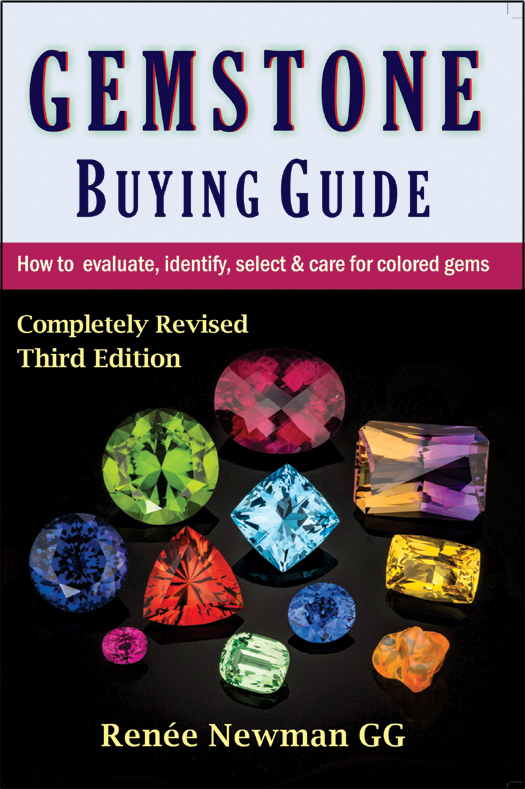 This is a quality buying guide that is recommended for purchase to consumers, gemologists, and students of gemmology—irrespective of their standard of knowledge of gemmology"
Newman discusses important topics such as how to judge phenomenal stones, discern deceptive practices and differentiate between various treatments. These aspects are well-covered in the text and are accompanied by excellent color photographs, charts, tables, line drawings and graphs. Newman’s well-illustrated chapter on shape and cut is particularly useful to students and new buyers of gems since it introduces all the outstanding new cuts that might puzzle cautious buyers. Readers will learn about color grading, how light affects color, and how color affects the price of gemstones. The chapter on treatments includes filling, impregnation, coating, diffusion and dyeing. Heat treating and irradiation are also discussed along with a list of stones commonly enhanced by irradiation techniques. The last part of the book has descriptions of gem species and varieties, again with excellent illustrations. Prospective customers learn about hardness, toughness, density, refraction, pleochroism and reaction to heat and chemicals." "Concise, up-to-date and accompanied by very fine photographs...With colour on almost every opening, few could resist this book whether or not they were in the gemstone and jewelry trade or were gemologists. Here the reader is given all the information needed to show the customer what a stone is, interesting facts about particular species and advice on cleaning and conservation. Some properties have to be given but they are introduced before the stones are described. Since this is not a gem testing book but an introduction to appraising gemstones, we are shown how to evaluate cuts, styles, color, inclusions –all with a view to establishing a specimen within an acceptable order of value as far as is possible. Treatments, phenomenal stones and synthetic stones are also described."